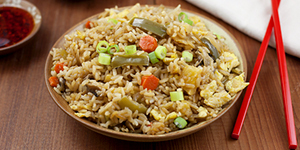 Just because summer is coming to an end doesn't mean the outdoor fun has to stop. 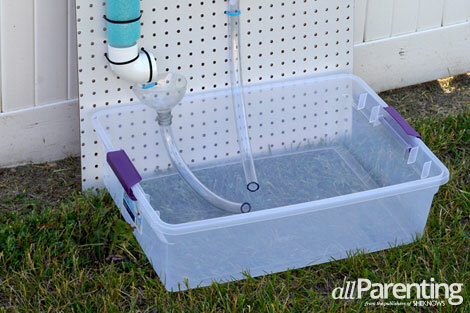 Create hours of fun and make the most of those last summer days with a homemade backyard water wall! There is something about kids and water — they are drawn to it. In the summer heat, there's no better way to entertain your kids than with fun water play. If the kids are getting bored with running through the sprinklers, try making a backyard water wall that will keep them cool and entertained! Start by thinking about what items would work well on your backyard water wall. Be creative! Funnels, pipes and plastic tubing all work well. 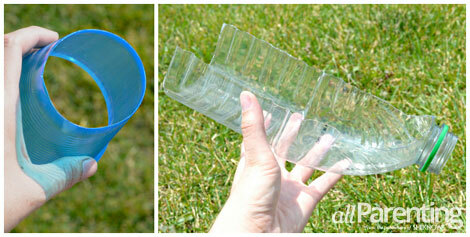 You can even cut off the bottom of a plastic cup, or cut a plastic jug in half to help funnel the water. Have the kids help you round up items that could be used on the water wall — just make sure they are waterproof! 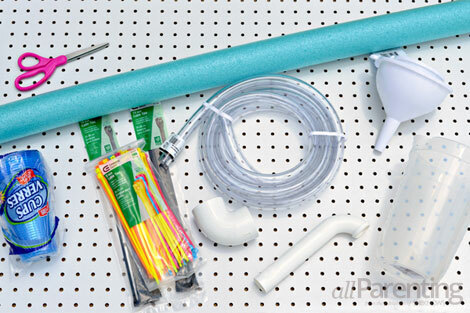 Plan out your water wall by laying the different parts out on the peg board. 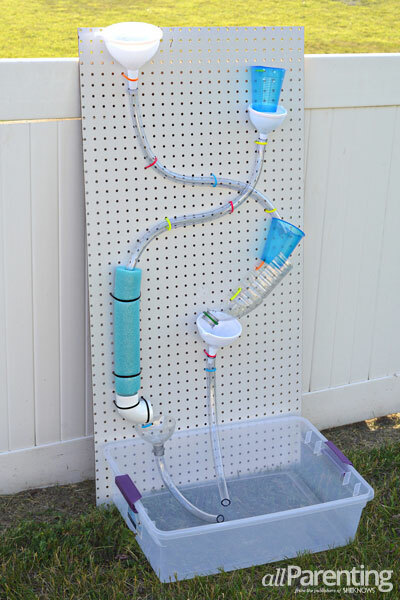 Create interesting paths for the water to travel by planning the design to travel back and forth across the peg board. 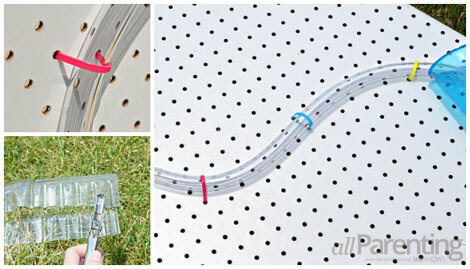 Once you are happy with the layout of the water wall, use zip ties to secure the pipes and tubing to the peg board. 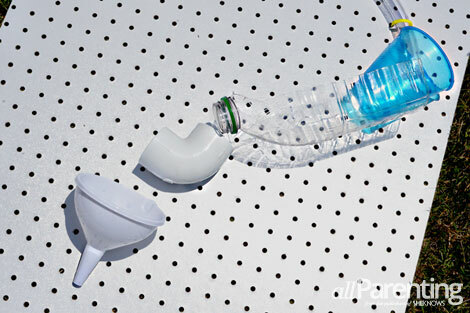 If you are using thinner plastic items such as cups or water bottles, you can punch a hole in them with a hole punch and feed the zip ties through the holes. After everything is secured to the peg board, prop the water wall up against a fence or other sturdy structure. Place a large plastic bin at the bottom of the water wall to catch the water as it flows down. Give the kids plastic cups or pitchers for scooping and pouring the water. 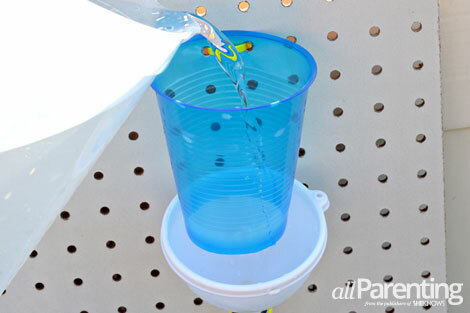 Pour the water in the top of the water wall and watch it fall for hours of backyard fun!